The Nike Air Max 93 has been back for over a year and seems to be enjoying the same mild success that meant that it never seemed to be as beloved as the AM1, AM90 and AM95. We’ve never know why it isn’t a superstar shoe — it’s popular, sure, but it’s not a megastar. 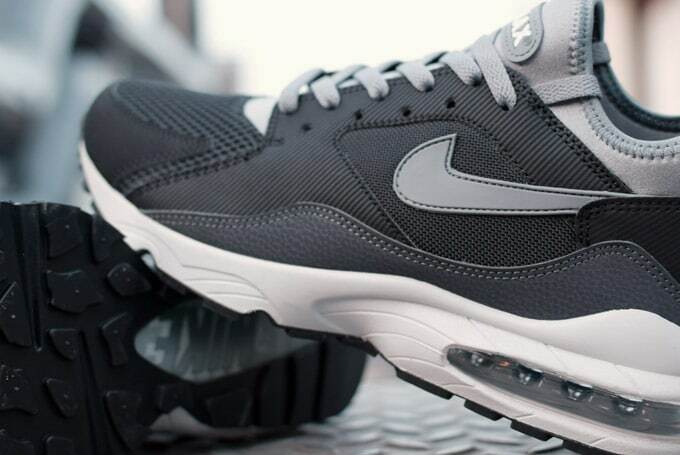 We’d blame some shape changes and a minimised Visible Air unit but that never seemed to hinder the 1987 incarnation of the Air Max, in its increasingly wonky forms. It might be Tinker’s favourite, but it’s destined to a certain cultdom while it’s siblings get all the admiring glances. That’s doubly odd when the 93’s lines, revolutionary cushioning and Dynamic Fit neoprene collar make it a thing of beauty — a change from the chunkier conventionality of old in terms of shape to something sleeker. It never seemed to get the spectacular volume of colourways that some other Air Max models got. Maybe it was the existence of the more conventionally collared Burst and the faintly underwhelming (well, next to the Air Max2) but never-retroed Air Max 94 that helped dull its impact. Not a lot can live up to those blues and tangerine like tones. This colourway, with its black, cool grey and anthracite, plus plenty of different textures (Nike Sportswear really seem to have gone giddy with the tonal pattern fabrics this winter) from the mesh to the weatherproofed overlays, and a little hit of 3M — it just works, and reminds us of some ST and Triax makeups we’ve loved and lost over the years. One day, people will hunt down sleepers like this, for for the time being, we’ll quietly appreciate them. These AM93s are in the store now.